An Infinity Pool is built in such a way that it’s missing a lip or edge on one side. In the right position, it would appear that the pool simply merges into the surrounding landscape. This is the latest trend in luxury home making, and gives a completely different, more upscale look than your typical in-ground pool. A sun deck or tanning shelf within the pool is a raised portion within the pool that creates a shallow area of about one to two inches of water in which to place the tanning chairs. Here the sunbathers remain connected and closer to the pool and the people that are within it. It’s a chic look that keeps everyone closer. Can you imagine anything more serene than a lively waterfall that the kids will love as well? Create your own oasis in the Las Vegas desert, and you’ll always be excited to come home. Embrace desert life, and don’t spend hundreds trying to keep up grass that won’t thrive in the heat. You can still get the tranquil color of green grass in your backyard using artificial grass with zero upkeep to get this cool and modern looking backyard. Fit for a king, a luxury fire pit allows the whole family to gather outside regularly to relax year round in the pleasant Vegas weather. Enjoy s’mores year round with the kids without going camping and leaving the comfort of your home. Be sure to accessorize the pit with plenty of seating and plush outdoor pillows. At MacDonald Highlands, the possibilities for a luxury home are endless. The choices are yours to create from your imagination the home you’ve always envisioned. MacDonald Highlands is the ultimate luxury community in the Las Vegas and Henderson area. 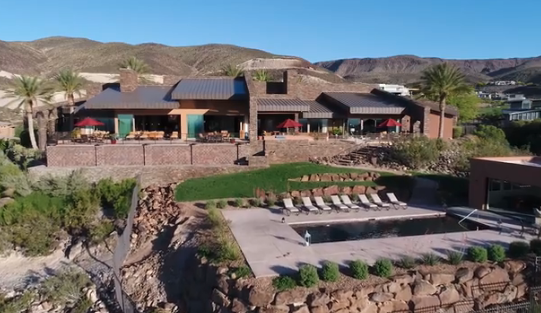 A gated and guarded community, it features a state of the art country club called DragonRidge, and is home to some of the most influential people in Las Vegas. To learn more about this prestigious community and get to work on building your dream home, visit our website or call us at 702-614-9100.